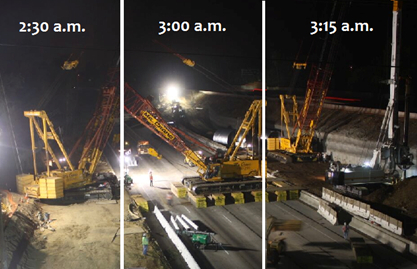 Cool sequence of photos taken early Tuesday morning on the 210 freeway as part of the construction of the “Iconic Bridge” for the Gold Line Foothill Extension, a key Measure R project. Early this morning, work crews led by Gold Line Bridge design-builder Skanska USA, relocated the 300-ton crane and large drill rig across the temporarily shuttered lanes of the eastbound I-210 Freeway. A dramatic scene, as well orchestrated crews first laid heavy timber beams across the freeway to create a protective path for equipment to cross without damaging the freeway. Once the timber beams were properly in place, the drill rig and crane slowly made the nearly 100-foot slog to the next work area in the center median, where the second and final bridge columns are to be constructed to support the 584-foot-long structure. Below are three time-lapsed photos of the crane moving across (the drill rig in the 3:15 image was moved earlier). The freeway was opened to rush hour traffic at 4:30 this morning. This intricate maneuver would not have been possible without the cooperation of Caltrans District 7 and the California Highway Patrol – to whom we send our thanks. Separately, the Surface Transportation Board (STB) approved BNSF’s request to formally abandon use of the rail right of way west of Irwindale. Earlier this year, BNSF and Metro came to an agreement on amending their shared use agreement, which included BNSF’s abandonment of the right of way from Santa Anita Avenue in Arcadia to the San Gabriel River Bridge in Irwindale. This is an important milestone for the project, affording the Authority full rights to the right of way in time for the alignment design-builder – Kiewit Parsons Joint Venture – to begin construction next year.